Summary: A pretty good week! We had 6 workers from E‑U's team plus Baw and Houa working pretty much all week. First job was to sand areas of rough fiberglass, then any areas that weren't flat got polyester filler and were sanded flat and smooth. Nut made excellent progress on the many complex surfaces around the entryway. Bank put a ton of time into trying to make our aft cockpit wall smooth and flat, but it's not there yet. Baw has taken over as one of our team leaders (the other is Chai) and seems to have taken a personal interest in making sure Ocelot is done as well as possible, which is certainly gratifying to see. He spent most of his time on the port sugar‑scoop, filling, fairing, sanding, and checking. The outer wall has a big hollow in it which needed a lot of filling and still needs a lot of sanding. Chai is nominal team leader for E‑U's workers but he spent most of his time on the starboard sugar‑scoop, making good progress. Song worked up on the foredeck, which is a big job given all the complex curves up there. Pooton worked under Ocelot, sanding back the bad gelcoat on the helm seat and then going after the louvers for our side windows. 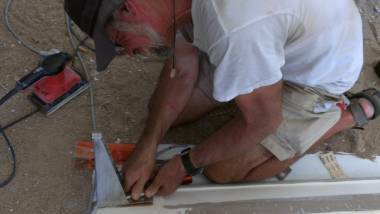 Sue spent much of the week sanding the mast and cleaning up deck hardware - hinges, latches, pad‑eyes, etc - and checking what needs to be repaired, but she also sanded the grooves for the swim ladders. She even got some more of the mast coated in Nyalic. Jon hooked up a new high‑capacity electrical line so the tools get better voltage, and rewired the power input to Ocelot so we get simultaneous 110v and 220v power, removed the solar panels from the targa‑bar, put up awnings on 3 sides of our tent so we get more shade to work in, removed some stuck hardware from the helm seat, and he bought 2 new sanders so we don't have to pay the high rates (7%/day!) to rent them from the yard. Houa essentially finished his work in the galley, finalizing the sink and its trim, building and mounting a new drawer, and fitting new hinges for our rubbish bin. Mike from AME Marine came by to discuss progress and took our hatches off to be powder‑coated. Amanda was our polishing queen, working long hours with mask and grinder on the aluminum spars -- the prod, forebeam and mast. She also worked up computer graphics for several versions of teak for the cockpit. A great start to the week, even with the threat of thunderstorms which luckily never materialized despite lots of thunder! We had an awesome day on Ocelot, with 6 workers from E‑U's team, plus our carpenter Houa and our man‑of‑all‑trades Baw. There was a lot going on, but for once it all felt pretty organized and progressive, rather than chaotic and regressive, even though E‑U himself was only on Ocelot for about 30 minutes in the early morning. Sue got to the boat before the workers so she had a chance to see how her Sunday water wash held up. By hosing off the deck (first time in a year!) she could see any obvious pools of water, or other problems. We now know for sure where the drain holes need to go on the 4 foredeck hatches, and we know that the cockpit area under the teak needs a lot of build‑up. With E‑U, Sue went down the list of important jobs for the day. 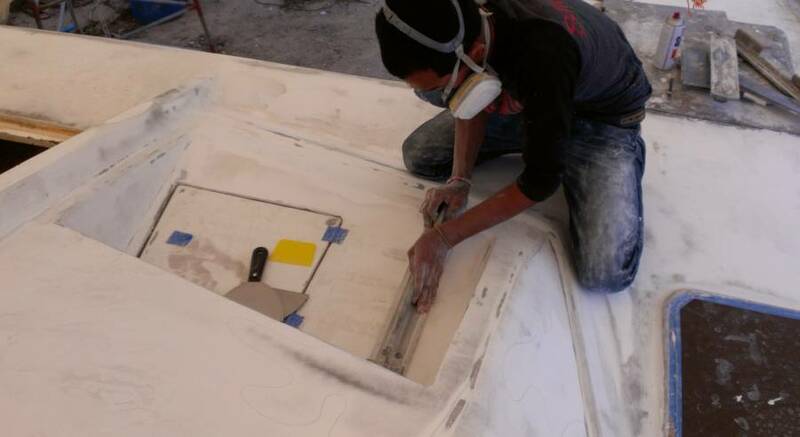 Bank was put on the sanding around the companionway, and although he sometimes forgot to close the sliding door, he put in a long, all‑day effort to get that raw fiberglass smoothed down and sanded. Young Nut was assigned the (less desirable) job of sanding the sugar‑scoops. 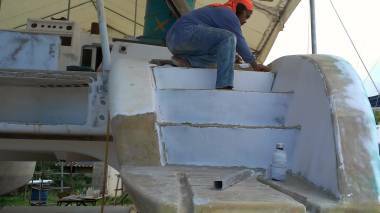 Sue pointed out that Khun Jon had sanded one WHOLE side of the bimini in a day, and we expected the same "1 day" effort on the sugar‑scoops. It seems that he took it as a challenge, as he certainly worked hard in that area for the day, and made some great progress. 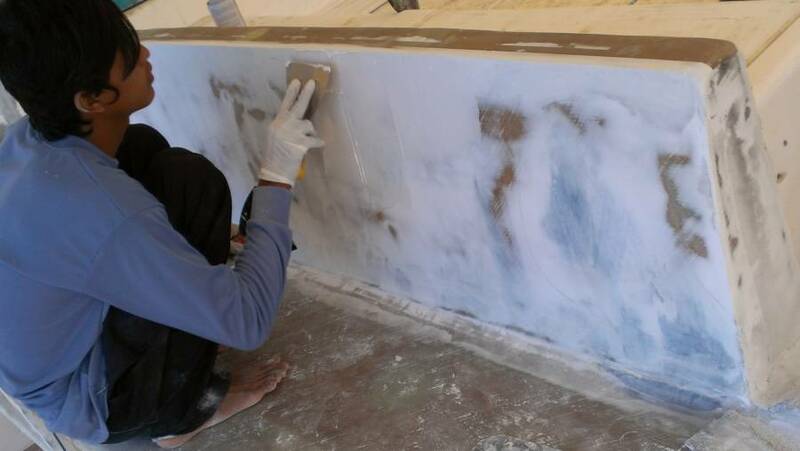 The tricky part of sanding the sugar‑scoops to "gelcoat ready" is that there are a lot of fiddly corners that will need "finger sanding" after the big areas are done with the orbital sander. But we're well on the way. Our careful and artistic worker, Baw, joined the others on the deck and we appreciated how he took time to talk to other workers about their technique or about the curves they were making. At least that's what it looked like he was doing! 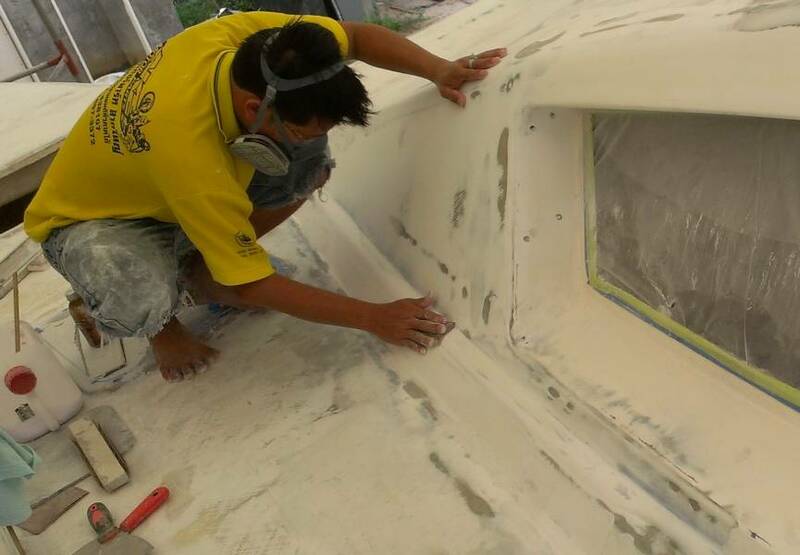 We have asked Baw to fill in a couple holes with fiberglass and epoxy but he has put that off in favor of working on the shaping of the foredeck "walls" and the general leveling of the foredeck. Baw has put a lot of time (and probably some heart and soul) into Ocelot's foredeck, and we suspect it's fairly personal for him to get it all looking perfect. On deck laying more filler we had Chai and a new guy whose name we haven't mastered yet. Chai is the nominal lead for E‑U's team but we don't think he's quite as jacked up as Baw, and Chai certainly doesn't have the connection to Ocelot that Baw has. 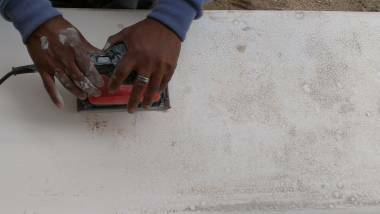 Chai was in charge of finding the low spots with the straight‑edge and marking them with a pencil. Then they would smear "nit noi" (just a little) filler over the needed spots, let them harden for a few hours, then sand them flat. Yay! Good technique, aimed at minimal polyester/filler usage and minimal labor time sanding! Chai also worked on the big radius curve on the port side which had been filled with bad filler, and scraped off last week. Also on deck we had Song and Lek who concentrated on the starboard side deck hatches. From what we could see (through all the dust!) they did a good job of making the filets uniform from one hatch to another. We will undoubtedly have more opinions on the hatch filets before we're done, but hopefully there won't be a LOT more work! Sue took on 2 jobs today. For the morning she sat in the shade up on the port sugar‑scoop and hand‑sanded the grooves where the swim ladders will go. This should have (could have) been a quick job, but unfortunately the workers who laid the fiberglass on the sugar‑scoops were a bit messy and the grooves had many small , very hard, blobs of epoxy. We need to get them sanded down and smoothed out not only for the gelcoat to adhere well, but also to be sure the new stainless steel ladders lie deeply in the grooves. Sue's other project for the day, when it became too dusty up on deck, was to get more of the deck hardware cleaned up. This involves disassembling the latch, handle or hinge, then scrubbing the parts with de‑greaser and water, or even sanding them. Sometimes there is old silicone to be scraped off. The goal is to have fully operational hardware, but that won't happen until we get a machine shop to repair some of the more mangled pieces. A fun but fiddly job. Jon played with the electricity again today, hooking up a new high capacity extension wire and box so that we can plug in many sanders. Then he buried the wire, a task that had him sweating so much he soaked his shirt. He also spent much of the day out and about on our motor scooter, buying things for the guys. One trip was to the local hardware store for acetone (in 4 liter metal cans) and spray paint which they use to mark the deck before sanding. Two trips sent him to big hardware stores, one local, one sort of for foreigners, to buy orbital (dancing) sanders for the guys to use. We found out on Saturday that we were being charged $3/day or $18/week/sander. This is a huge rip‑off, as Jon paid less than $50 for each sander he bought. The guys prefer Maktek (a budget Makita line) but Jon could only find one, so the other was by Skil. 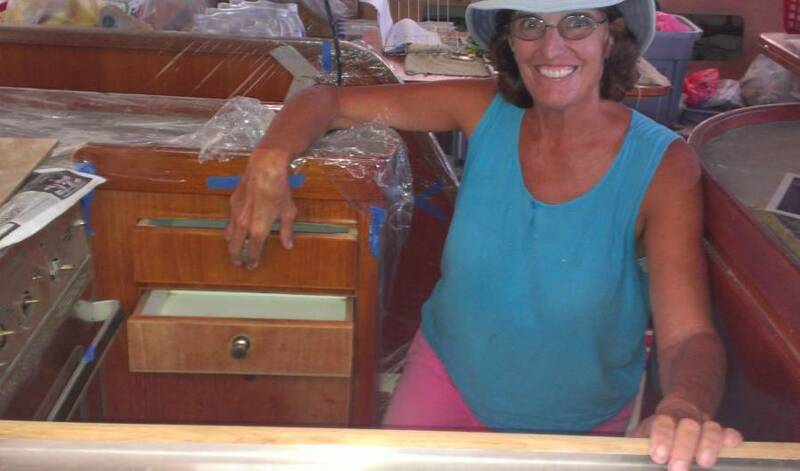 Houa did some final work in the galley sink area, sanding the long teak pieces that make the trim on the sinks. He also sanded and fitted the two ornamental teak strips that go on the white formica facing. Then he screwed them all in place and VOILA! We have a beautiful sink‑side galley! Next project: the new drawer across from the sinks, above the flop-out cabinet where we put the trash bin. We lost our cutlery drawer when we put in the new stove and oven. The old one was split, with the cutlery drawer between the stove and the oven, so now we're looking for more drawer space. A hard rain surprised us all last night, but at least the day was cooler with an overcast sky. Another landmark day on Ocelot. 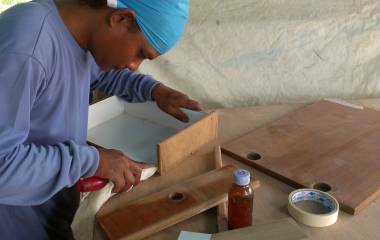 Having 9 workers, 7 from E‑U's team, and our own Houa and Baw, meant that many things were happening all over the boat and in the workshop! Sue arrived early again, to be sure that the day started off right. The start time has been sliding from 8:30 to 8:45 so that will be something to talk to E‑U about. But otherwise, the guys were working hard all day and their much‑needed breaks were short. 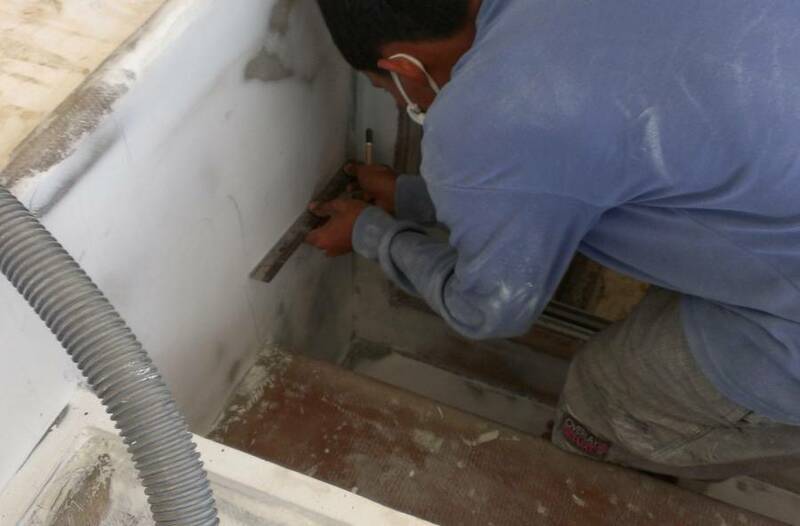 Houa spent a bit of time in the galley putting in the teak plugs to fill the screw holes in his new sink trim. The rest of the day was spent on the making of the small new drawer that will go under the existing one, over the tilt‑out cabinet where our rubbish bin lives. Having lost one drawer to the new stove/oven combo, it will be nice to have a second small one up near the other. The other 8 workers were all over the decks all day. Dust was in the air, and all were wearing masks, Darth Vader breathers, or had cloth wrapped around their heads. It was also wonderfully noisy, with the sound of sanders and Thai pop music blaring on Song's portable speakers. Song and Lek and Baw were the masters of the foredeck. They spread more filler to small areas, moved on, then moved back to spray marker paint. Then the sanding began, with frequent stops to check the level and the curve and the tilt of each area. Ocelot is a real study in complex curves! Nut, Pooton and Bank had the non‑glamorous, but necessary jobs of sanding areas where the new fiberglass is still rough. That meant all day on the sugar‑scoops, the aft deck, the aft cockpit seat and at the end of the day, work on the port cockpit seat. The latter needed lots of filler, as it had been repaired with foam, and the foam was inset a bit below the rest of the seat. The aft deck itself will not be getting non‑skid and gel coat (we'll put teak there) but it still had to be sanded, so we let Pooton carry on anyway. Starboard sugar‑scoop area and the steps were looking great, so we OK'd the filler that will create the final smooth shapes on the sides of the steps and the inner wall. It was nice to see Chai using the aluminum bar to check the flatness of each area, and then lean back to scrutinize to the lines. Chai and Bewn worked around the companionway, which needed not only a lot of sanding (rough fiberglass), but then a lot of filler. That whole area had been pulled apart and re‑built in May, and the walls had never been filled out to their final shapes. Yay for polyester filler! 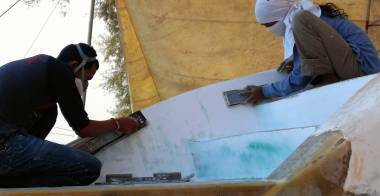 It's amazing to think what might be under every boat's beautiful gelcoated surfaces! OK, not every boat, but Ocelot's, anyway! Sue put in a lot of meditative time sanding the mast with 400 grit. She's working on the upper third, above the spreaders and it won't be long now before it's ready for Nyalic. Just a couple more hours with 1000 grit, and it'll be ready to go. All we need now is a day with no rain, no wind, no dust. Sunday, anybody? Jon spent much of the day up in the rafters of the tent still working on our rain and sun shade. He also was in and out of the yard several times (after getting the scooter's flat tire fixed in the morning) to get more sand paper and other things we run out of often. We have GOT to learn the Thai for "I'm going to the hardware store. What do you need?" The dry Northeast Monsoon (season) is supposed to be here, but the air is still heavy with thunderstorms. It was overcast all day today but luckily we had no rain. Ocelot was abuzz with the whine of 3 power sanders, Houa's table saw, the grating of hand‑sanding, and happy voices singing along to Thai reggae, Thai rap and Thai pop music. We love it! We had 7 of E‑U's men today, though Song left after lunch for some reason. (We're the last to know!) Chai took control in the morning and asked if we wanted someone to sand the helm seat. Absolutely! So he put Pooton onto it, and he enjoyed working in the workshop near Hoau for the day. The helm seat is heavy fiberglass and stainless steel, and we had planned to re‑make it in lighter materials. But with the money crunch and time, we've decided to renovate what we have. It will need some new gelcoat filler where the old gelcoat bubbled up. Then it will get a whole new dressing with the new gelcoat that is supposed to be much better at resisting water entry (blisters). Houa got the new small drawer for the galley essentially finished, save for screwing the front teak onto the drawer box which is fully lined with white Formica. The front teak was cut from the cabinet below where this will go, so the grain of the cabinet and both drawers all line up vertically. We were happy to see this project move along so quickly. 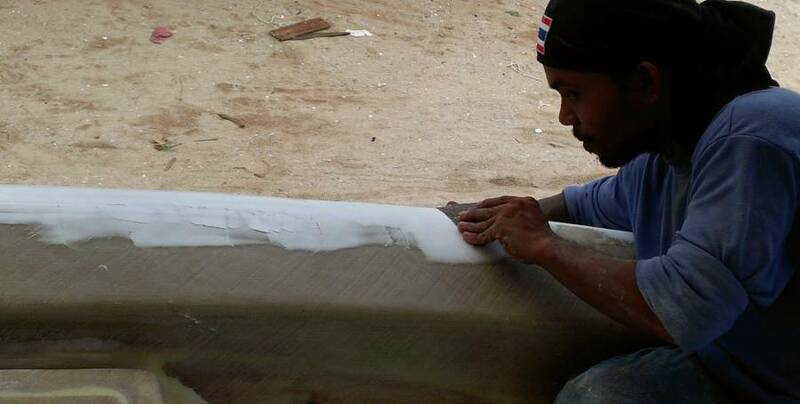 There's no doubt that Houa is in his element when working with wood, not fiberglass! Baw and Chai each took one of the now‑sanded sugar‑scoops (Baw on port, Chai on starboard) and worked their magic with filler. These areas are tricky in that they were built as extensions of the old sugar‑scoops, and though we tried, we did not get the internal walls exactly the same. One has a bit more convex‑ness than the other. The filler will go a long way to unifying how they look. 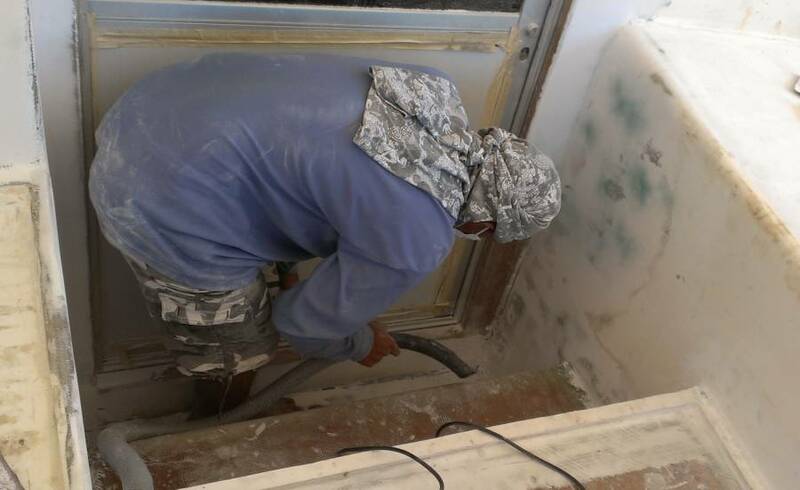 It was nice to see Chai using the aluminum bar section as a tool to "screed" the filler up the surface, leaving filler only where needed, and allowing the low spots to fill. 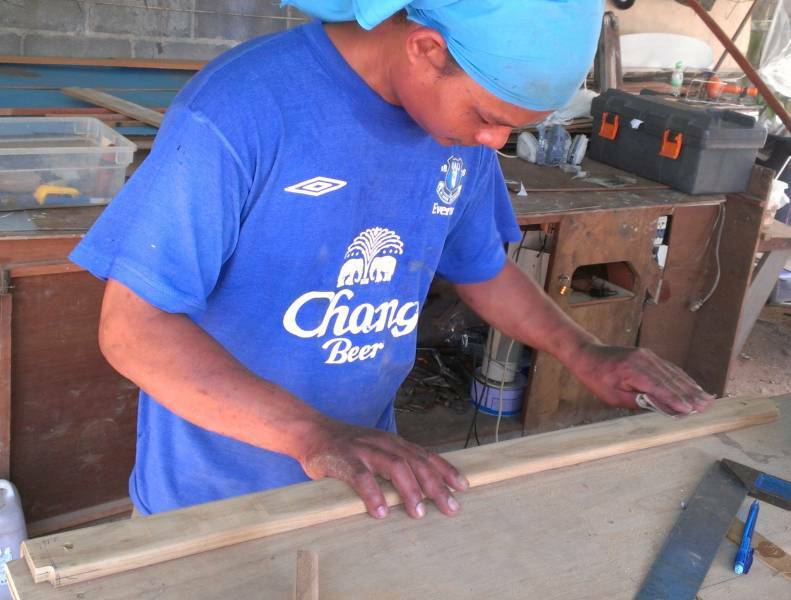 Chai, as the team lead, appointed Bank to our requested task of sanding back the (shiny!) new gelcoat on the targa bar. This felt like a bit of back‑tracking, which it was. But it's OK because we're now on the right track; i.e. we will be putting the ISO‑2500 gelcoat in our chosen color up there instead of the default all‑white and "turns‑yellow‑in‑a‑few‑months" local gelcoat. On the foredeck, Lek, Bewn, and Song further faired the deck and its coamings. Baw moved up there from time to time to consult on shapes. There is no doubt that lots of filler has been put on and sanded off, but it seems to be inevitable, so now we just let them do it. One advantage is that we'll have a very white‑looking boat even before all the gelcoat is sprayed on, so that should be psychologically encouraging! Nut took on the task of fairing and filling the companionway area that was started yesterday. It was a pretty confined space with lots of dust flying, but he hung in there. We still see some places that need more filler, like where we had to re‑build the walls after finding and removing the wet balsa. It's not done yet, be we're getting there. Unfortunately, this prevented Jon from trouble‑shooting why we're not getting power to our battery‑charger, but we've got several days of battery capacity, so that job can wait a bit. Jon followed up the sanding of the targa bar by dismounting the solar panels. Waaaa. But it needs to be done, before the new gelcoat goes on. Jon gets to claim the worst accident of the season, but it could have been much worse. 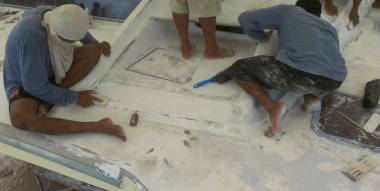 He hadn't realized that the workers had moved the engine hatch cover to the side, and when he stepped there to get off the boat, he and the engine hatch plummeted into the port engine room. Crash, bang, clunk, rumble. He emerged with a bleeding lip, scraped arms, and a bit shaken. But not stirred. He's recuperating well. Sue spent the morning supervising the men, eyeballing the filler lines and curves, taking pictures, and generally watching over things. Then she attacked the mast for a couple hours with sand paper, ending with spreading paint remover once again, into the tiny crevices that were missed before. The Nyalic coating is clear, clear, clear, so any old white paint or yellow aluminum primer left on the mast will be very visible. After an hour she did a major wash to get the toxic paint remover off the aluminum. Jon's big adventure for the afternoon was to organize and erect a huge sun shade over the mast and spars off to the port side of Ocelot. This covers an area with electrical wires, a couple big trees, tires with concrete in them that can't be moved, and our mast, supported on barrels. In other words, not a useful space for the yard to put boats, so we hope there are no objections. After lunch Sue took on the fun job of removing all the silicone from the edges of the targa bar and the solar panel supports. More regressive work, but necessary for getting the targa‑bar ready for the new gelcoat. This meant standing up on a narrow plank for 2 hours, wearing a face mask for breathing safety, leaning on the targa bar, and scraping silicone off the gelcoat on the back side. Not difficult, but fiddly, hot, and dusty. She finished up just as Jon began to raise the new shade awning. Blustery, rainy night, but we were tucked up in our apartment, all snug. Yay for rain at night and sunny days! Another wonderfully busy day on Ocelot, with a full team of 9, plus Jon, Sue and Amanda! 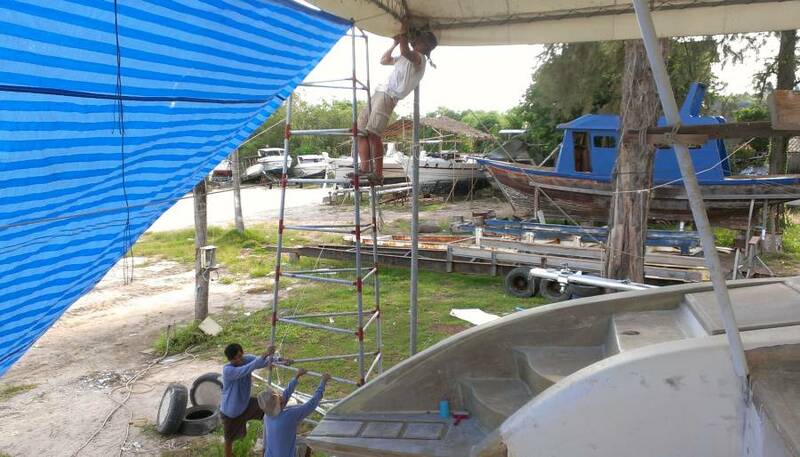 Jon continued to erect awnings (pieces of tents) around the boat so that we can all work in shade but still have a breeze. 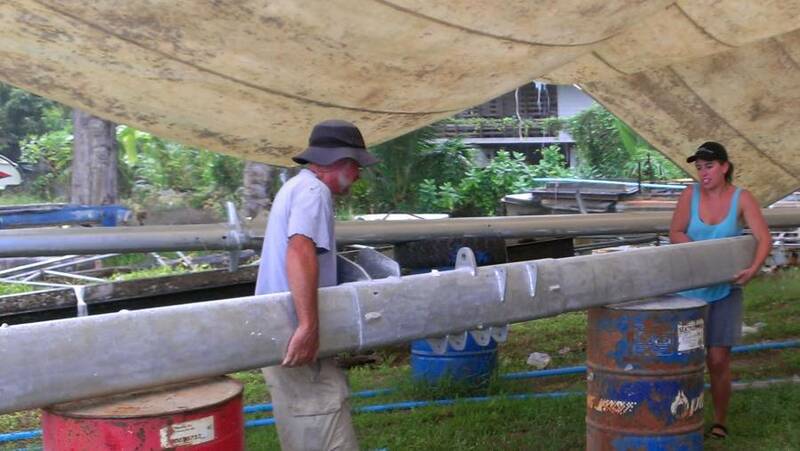 He finished erecting the big one on the port side, over our mast, boom, and forebeam, and then put up a smaller awning in front of Ocelot, from our big tent to the concrete toilet block. We now have shade awnings on 3 sides - port, front, and back. We actually have an awning we can use on the starboard side, but we're afraid that if we put it up the yard will charge us more for using more space. The places we've covered so far are places that the yard can't really use. 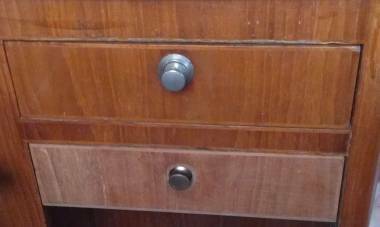 Houa finished the last detail on the new little drawer and will begin work on the swing‑out cabinet for the galley. Our fancy cabinet hinges are not available here, so he will have to create a backing plate of teak, for the new hinges for that cabinet door. 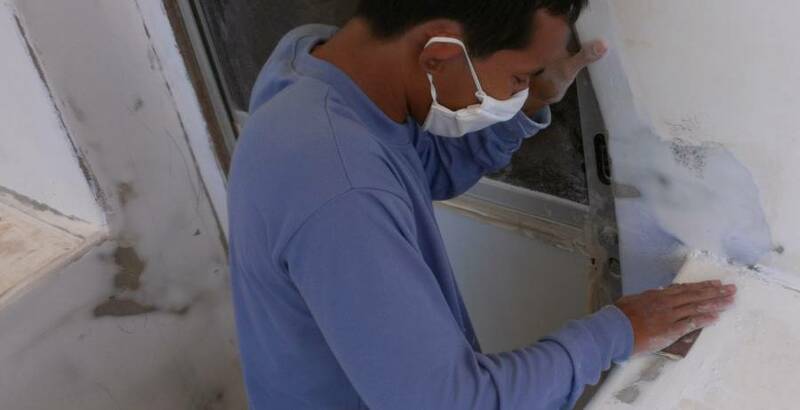 Houa got a bit of a break today, as he and Bewn offered to scooter into Phuket town to Phuket Fiberglass to buy more polyester resin, Q‑cell, and face masks. We always give him something extra to pay for his scooter fuel. Under the shade of Ocelot Pooton continued his grinding and sanding of the helm seat. It's not quite finished as we had to remove the two stainless steel legs and 4 of the bolts were fused in place. Jon's afternoon project was to remove them, a job that required some ingenuity. 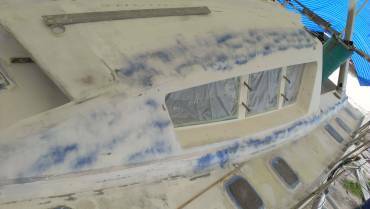 Without being asked, Pooton cleared the big work table and set himself up to sand the 4 louvers that cover the port and starboard cabin windows. They need to be prepped for gelcoating like everything else up on the boat! They had no antiskid on them before, but we're considering putting some on this time, as we use them as stairs to the top of the main cabin, and they can get slippery. Nut spent the day in the confines of the companionway, checking flatness, adding filler, sanding, and then vacuuming, over and over. He worked tirelessly, and was a good sport about our frequent jaunts past him into the inside of the boat. 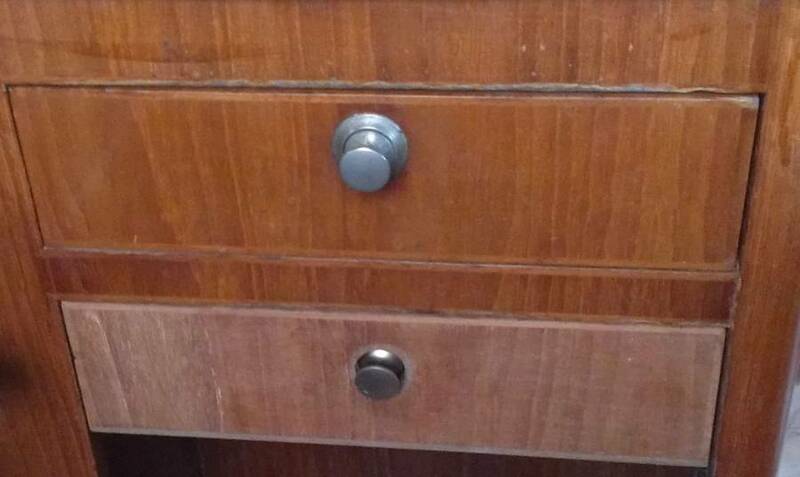 Jon and Sue had to get tools and materials from time to time, and Houa was in and out fitting his new little drawer and prepping to re‑make the swing‑out cabinet under the drawers. Song and Bewn were the foredeck team today. Song worked on leveling the new "eyebrow" areas at the very front of the cabin top. We had to make sure he understood that the change in slope from cabin top to eyebrow was okay. We didn't want an inch of filler to give the eyebrow the same slope! Bewn worked on shaping the fiddly bits around the chain lockers, and sanding the hatch edges. Chai and Baw went back to their "stations" on the starboard and port sugar‑scoops, where they worked yesterday. With occasional consulting to be sure they were creating the same shapes, they worked to give the newly built extensions the same curves and angles and wall dimensions. When the extensions were built, a lot of care went into making them the same, but the final shapes were determined by epoxy filler and then fiberglass. What the guys are doing now is the fine‑tuning of the shaping. They are truly sculptors of polyester filler! It's nice to see them (especially Baw) taking such an interest in getting it all as perfect as they can. Bank divided his time between the foredeck and the aft deck. He sanded down the back of the cockpit seat and put filler on the top, ready to re‑create the curved edge. We handed up the cockpit mini‑doors, and were happily surprised that they DO fit. 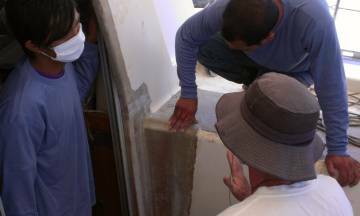 There was some concern that the little thresholds that are under those little doors had gotten too big when they were re‑made out of epoxy and fiberglass. Amanda braved the aluminum dust (wearing a mask) shaky arms and hot sun (until she moved under Jon's new awning) to polish the mast. 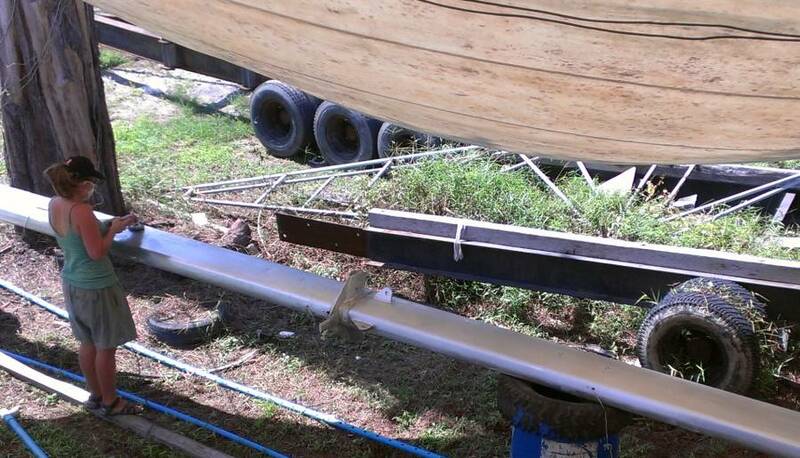 We are so close to being able to apply the Nyalic to the rest of the starboard side of the mast! But the machine polishing is necessary so that the final hand sanding with 400 and 1000 grit leaves a clear, clean look. Sue spent the day, as usual, climbing the ladder or scaffolding a gazillion times to take photos, answer questions, fetch things, pay for supplies and still try to accomplish something "useful"! 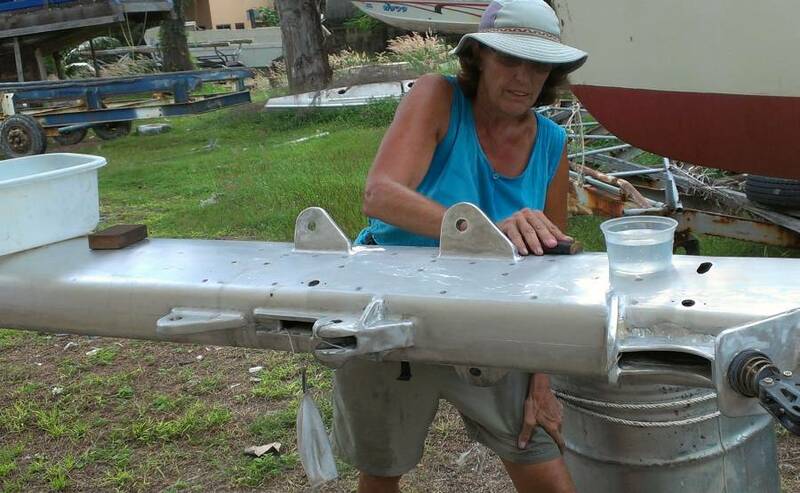 Her useful activity for the day was finishing the disassembly and clean up of the hardware of the 12 small deck hatches so we can send them off to Wiwat's at the end of the week to get them powder coated a nice "aluminum silver." Yay! It's Friday! Oh darn, Amanda just pointed out that means it's really Thursday, since they work 6‑day weeks here. We had rain for much of the morning, but with our new awnings work didn't even slow down. The seventh day of a team of workers on Ocelot and things are looking really different! White, white, white. Although it's filler, not paint or gelcoat, it's still exciting to see! Pooton continued his one‑man sanding event on the dis‑attached bits of Ocelot that will be gelcoated. He was almost finished with the helm seat, but had to move to the louvers and a hatch cover while Jon attacked the recalcitrant bolts that broke off in the seat. Apparently we have to get rid of every tiny bit of rust or it will leak straight through the gelcoat. Details, details. Chai worked all day on the starboard sugar‑scoop again. Today's main project was to get the top of the extension around the engine hatch to match the shape that Baw put on port yesterday. 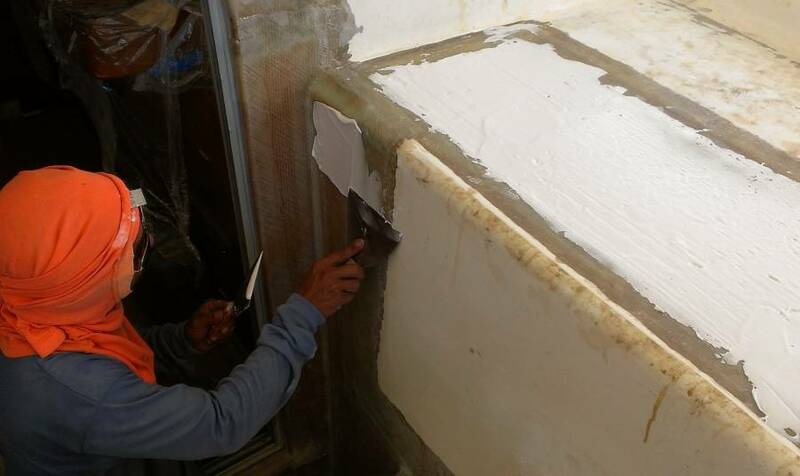 This meant building up a small wall of filler to the outside edge of the hatch. While that filler was hardening, he worked on making sure the extension wall was nicely shaped on its top edge. Baw and Lek worked together on port sugar‑scoop, which has some issues - the outside wall has a significant hollow. Baw put his efforts into making the outside wall look nicely rounded, like a true extension of the hull. Bow doesn't ask many questions, preferring to work things out himself. It's fun to see him looking at things from various angles, concentrating on how best to make it look how it should. We have known about this slightly concave bit of topsides, and had hoped it was solved with epoxy filler and fiberglass months ago, but it's one of the things that got started but never finalized. So now we'll have more filler out there than we would like, but the option is a concave boat side. Not pretty. Hoau got the weird Thai hinges put on the last galley cabinet. This is the one that is vertical, and hinges out from the bottom to open. The work conditions in the galley weren't nice today, as the air was full of dust, and he couldn't have hatches open or there would be more dust! Nut continued work on the companionway area, checking the flatness of the walls with a straightedge, then putting more filling in. Then sanding, sanding sanding. Cleaning up. On and on. It will be nice when this area is finished so that we can get into the boat more easily, without having to step past Nut and his wet polyester. Song worked on the foredeck again, and it's looking great We're hoping he's almost done, although the guys still have to sand the hatch gutters so that we can get gelcoat in them, to protect the fiberglass from water encroachment. Bank worked on the aft seat wall once again. This is one of the places that will look really bad if it's rippled, as it's sort of in your face when you come aboard. Mike Cherry from AME Marine came by mid‑day. He has a company car now (instead of the motorbike) so he brought us 3 drums of our new gelcoat(! 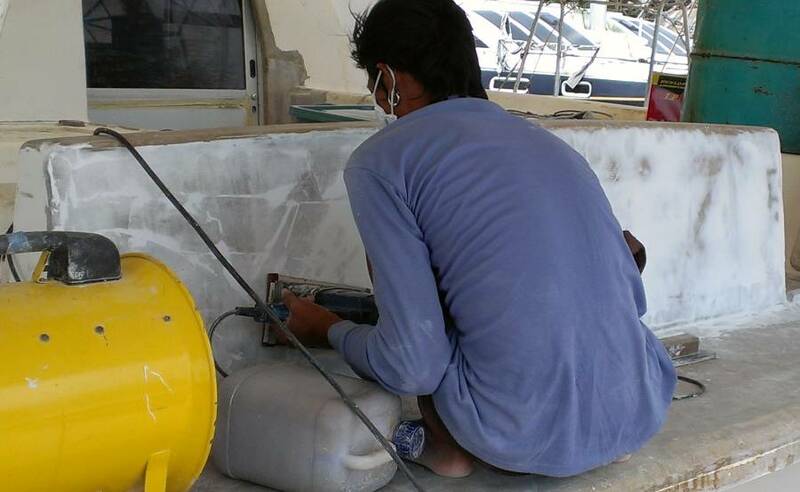 ), and more polyester resin, the kind they want us to use on the hull before gelcoating. He also took away the 14 hatches that Sue had prepared, so that they can be powder‑coated a metallic aluminum color. The powder coating will keep them from corroding further, and give them a "new" look which the clear Nyalic could not have done. 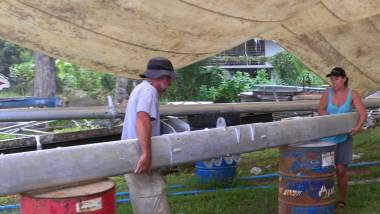 Amanda, with Jon's help, moved the forebeam into the shade of the new tent and away from the sanding dust flying down from Ocelot. She spent the day with earphones plugged in to give herself her own music, not the sound of sanders, grinders and Thai reggae. She got about one‑eighth of the forebeam done. Morning rain prevented her doing the final bits on the mast. Jon spent much of the day trying to find out why we're getting no power to our battery charger. After taking everything to bits and rebuilding it he found that there seems to be a break in the wire between where power comes into Ocelot (in the aft deck) and the electrical switch panel. He'll chase that down tomorrow. But while he was chasing electrons, he redesigned some parts of it to work better, giving us simultaneous generation of 110V and 220V whether we're getting our power externally or generating it from our inverter to run tools or the washing machine. The week finished with a bang! A massive thunderstorm swept through in the afternoon, but it barely slowed things down. We had 8 men on board today, plus the 3 of us, so things kept moving right along. The biggest "Finished!" we get to celebrate is that Houa re‑mounted the galley swing out cabinet. Once he replaces the hinges on Monday, he'll be finished with the galley refit. Apparently Baw will do the necessary varnish work when there's less dust in the air. Jon scored a win on our electrical system. We'd never bothered to plug into marinas because our solar panels have always provided us with all the electricity we need. 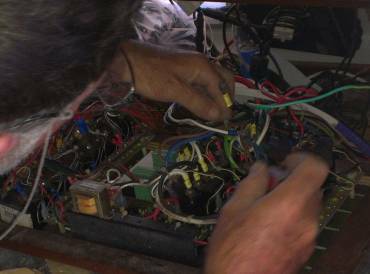 But winter in South Africa with (then) old batteries made us go out and buy a 220v to 110v transformer so we could plug Ocelot into shore power. Jon did the job quickly and it wasn't elegant, but it sort of worked for those few times that we needed it. Today Jon replaced the wire that goes from our AC power inlet (on the aft deck) to our big circuit‑breaker panel above the nav‑desk. This got our battery charger working again (which it hasn't for the last 4 days) but it also got Jon thinking about upgrading our electrical system. With a bit of rewiring he was able to get everything behind circuit breakers (which the transformer wasn't). Perhaps even better is that we can now use the transformer to make both 220v AND 110v whenever we want it, whether we're plugged into 220v shore power or when we're making 110v AC with our inverter. This will allow us to run the washing machine (which used to have its own dedicated transformer) and any other power tools we need to use. Our power tools have always been 110v from the US, but as they die we're having to buy local tools which require 220v, and now we can power them from the inverter. Perhaps most surprisingly, his modified circuit worked the first time. This is sort of like having your computer program work the first time - it NEVER happens (ask any programmer). The biggest change to Ocelot's "look" is that Baw and his helper Lek made major strides with the long boards creating a nice rounded look to our port sugar‑scoop. This will take more (hard) work, but we're beginning to see the final shape. The starboard sugar‑scoop doesn't need as much filler but Chai put some on so the 2 sides can be made to look identical. Baw originally made the starboard outer wall after he'd made portside, so starboard benefitted from his increased experience. These guys are our 2 best fiberglass guys, so we're feeling more comfortable about letting them run with this project. The sugar‑scoop steps aren't getting any filler on top (for now). They'll be getting anti‑skid, which will apparently smooth out imperfections up to about 1mm (0.040"). But the vertical walls will only get a final spray of 2 layers of gelcoat, so they need to be fair and smooth and the correct shape. Bank continued working on the back of the aft cockpit seat. This is an area about 10'x3' (3mx1m) and was already pretty flat, so we're not sure why it's taking him so much time. Song and Nut continued their work on the foredeck and companionway areas, respectively. These areas are quite complex, with lots of faces that need to be flat and curves up on the foredeck. They seem to be making good progress, but it's slow going. Amanda pretty much finished polishing the mast (at least, the side that's currently facing up). She has a bit more to do at the base and some of the fiddly bits like the spreader bases, but it's looking very nice. She also got much of our new prod polished up. Sunday is usually our (only) day of rest, which we usually celebrate by going out for a nice brunch. But it's also the only time that the air is free of grindings being sanded off Ocelot. So Sue decided to go in early to put some Nyalic on some more of the mast. She did about a 10' (3m) section above the 2nd spreader, and also put a 2nd coat on some of what we've already done. And all before breakfast! Then we all went to our favorite bakery for a nice breakfast, and after that we all took a local bus up to see The Hobbit - for under $5 each!